I’m not a fan of sports games. The only sports games I occasionally play are basketball games and even then, I don’t go out of my way to play them. I’ve just never found sports games particularly that interesting unless there’s some really unique or creatively fun twist to them, for example those old Midway “Blitz” games. That’s why I can’t help but like Rocket League, developed and published by Psyonix for the PS4. 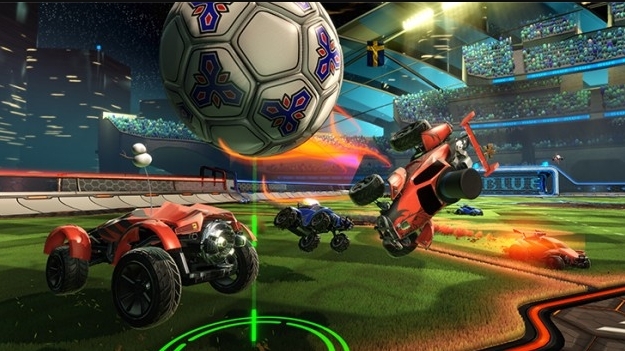 Rocket League is a soccer game, but not one that you’ve ever played before. 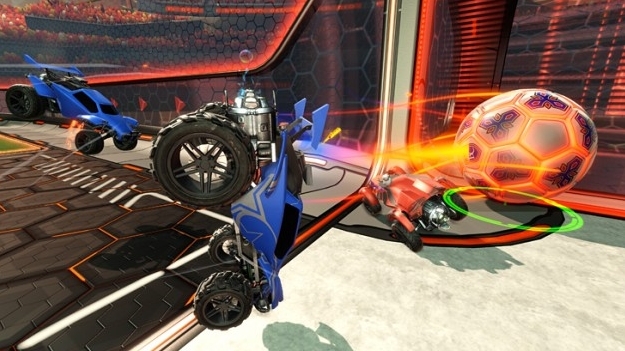 Rocket League is played with vehicles that can do things no vehicle in the real world can do. The vehicles you use are incredibly agile and fast and can do things like drive up on walls and boost into overdrive. What makes them especially different is their ability to jump into the air at will while also performing some rather complex aerial acrobatics. Not only that, a little bit of boost can completely destroy an opponents car giving you a slight advantage for a few seconds. The main goal of Rocket League of course is to score and score any way possible. Everything in the game is physics based so the ball will go in the direction that physics wants it to go. Hit it just right and it’ll head towards the goal beautifully. If you don’t, it can go veering way off course or even into your own goal. It’s a very fun game and one that is fast paced and hectic depending on how many players you have on the field at once. The game can be played as 1vs1, 2vs2, 3vs3, or 4vs4. 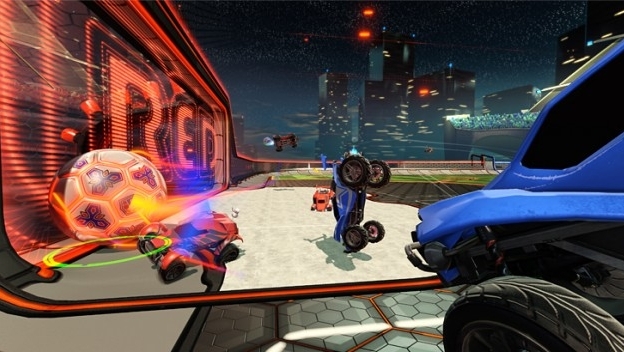 What’s especially nice about Rocket League are the various ways you can play multiplayer. The game has online multiplayer where you can play with your buddies online as well as local multiplayer, which is something that is absent from many games these days. Split screen is what I’m enjoying the most of right now since this allows me to play with my son at the same time. We’ve played a few 1vs1 matches and have also started a season mode of 2vs2 against bots and it’s incredibly fun. Above is a clip of what split screen looks like. As you progress through the game, you’ll level up and unlock a bunch of cosmetic upgrades for your vehicle. You can unlock things like new bodies, paint schemes, graphics, wheels, and even hats to wear. I don’t really think they add anything in terms of performance upgrades, but it’s a fun addition that lets you personalize yourself. Overall, Rocket League is all kind of fun. I love the fast paced nature of it and the fact that this actually makes the game of soccer fun and accessible to all. There are no crazy rules to learn, just try to score a goal any which way you can. If you’re a PS Plus member, download this for free right now and find some friends to play with. 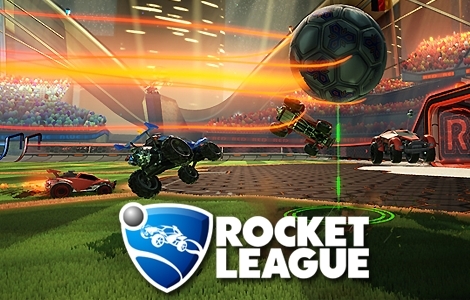 Whether is local or online multiplayer, you’re sure to have a blast playing Rocket League.